Nigeria's match against Seychelles marked the beginning of the second half of the Gernot Rohr era, following a largely unremarkable world cup, defined more by what could've been. Readers of my blog might have noticed that I am yet to pen a review of Nigeria's world cup performance. This is largely the result of the fact that in my opinion, the key issues in the overall performance reflect long term problems that relate more to Pinnick and his leadership of the NFF, than Gernot Rohr, and would need to be addressed separately. The reality is that the production of talent, both in terms of quality and numbers has stalled badly in Nigeria, and this relates to issues in the organization of the domestic game, both at the technical and the management level. The Nigerian domestic game has proven to be incapable of developing players of international calibre, a situation that has existed since the early 2000s, with no serious attempt at resolution. Perhaps nothing underlined this sad state of affairs than the use of goalkeeper Francis Uzoho, from the youth side of a relegated La Liga side. I'm curious, at which point do you lay the blame on domestic clubs? FUFA endured the same problems on the domestic front with clubs obstinately sabotaging federation plans and players. The opportunists, running clubs were mostly to blame and professionalizing their operations has been a struggle. Pinnick cannot do everything. I think the clubs and states should meet the NFF halfway. The current drama doesn't help either and is another example of why one may be inclined to give Pinnick a break. Same old, same old from Rohr today. They'll qualify for the ANC - probably behind South Africa - and I'm expecting little at the tournament. I see you somewhat agree with me regarding Ighalo. He really has no business being in the squad, inspite of Rohr insisting on a holdup man. I mean, of what use is a hold up man who continues to holdup our counter-attacking play and flow? The sooner the guy is off the squad, the sooner our attack will be more fluid and the squad will score more goals. You are right that most of the responsibility lies with the clubs. But Pinnick holds the keys to the access door to the NPFL. He must use the leverage to force real changes or nothing will happen. One option in the current reality. There are others. I am in VIOLENT disagreement with you regarding the statement you made (emboldened). Current reality is what you make of it!! You may choose continued reliance on a guy who has repeatedly failed to deliver when it matters (with the false hope that he would get better with age - notwithstanding the fact that he is on the downward slope of his career at 30 or so). Or you may chose to explore other, more credible and viable options out there, with the hope of finding a better fit. I mean, of what use is someone who is supposedly good at 'hold up play', when he holds up play during our counter attack and contributes absolutely nothing else? I would strongly argue that NOW is the time to start grooming potential candidates for the position. You mentioned Solanke as an option. I would throw in Danjuma (Club Brugges), Dessers (FC Twente) and Simy into the mix. They all have great pace, good ball sense and imposing physical presence, something Ighalo at 5'7" absolutely lacks and will never have. As an interim measure, use Musa as the point man. His pace down the center will complement our pacy wing play. You cant beat that! Nff really need to step it up and poach Solanke, now that he isn't on England's radar... Danjuma will also be a big coup for us. Ighalo is useless. TXJ: Cameroon is the HOST of the AFCON-2019; why are they playing in the qualifiers? Is it to enhance their skills (preparation)? Any Forumer who know why should please [also] answer my question. Thanks "Txj" and to all - in advance. Exactly, Nigeria is to exactly brimming with world class striking talent. The back up striker on the bench against Seychelles was Simy Nwankwo (a Div 2 player). Other options outside the squad include Osimhen and Kayode. Not exactly elite goalscorers. Nice write up. I agree that we have to move on from Ighalo. There is no way he is the best option we have to serve as a target man. As at today, I don't see a better option in that lone striker role, sad to say...outside the use of a wide player like Musa. Question for you on Omeruo's positioning on the first Argie goal based on the the map above. Is this something that you have observed on multiple occasions with him? I think its a bit harsh to judge him based off this mistake on that messi goal which was as a result of a heck of a move by Messi as he moved towards the ball causing Omeruo to bite (when this snapshot was taken) and then Banega dropped the ball into the space behind the defense. I thought the error was a fault of the repeated lack of pressure on Banega, coupled with the high line that we played (especially in light of the lack of speed in our CB's) which gave Argentina time and space to repeatedly drop the ball behind the CB's. Idowu was also caught ball watching, and didn't anticipate/track messi's run. 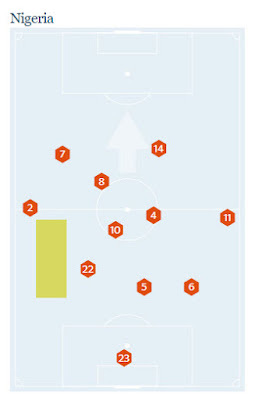 The CB's in the back 3 are supposed to stay pretty close to each other, with the WB dropping to support on the flanks in the non-possessory stage. Enyi, abeg you sabi football!